Giving you a chance to sample some of the most delicious protein bars on the market, each of these handy protein bars act as a wonderfully tasty snack and a source of good quality protein. Please note, flavours may vary depending on availability. SiS Protein Bars contain a blend of easily digestible proteins (20 grams per bar) in the form of whey, casein and soy protein. It is important to consume protein in close proximity to training sessions (i.e. before or after training) in order to maximize training adaptations. Protein intake is often overlooked by endurance athletes. SiS Protein Bars provide an appropriate quantity of high quality protein for before or immediately post exercise. For optimal protein synthesis to occur, it is crucial that we consume high quality protein given that protein contains amino acids that make new proteins. 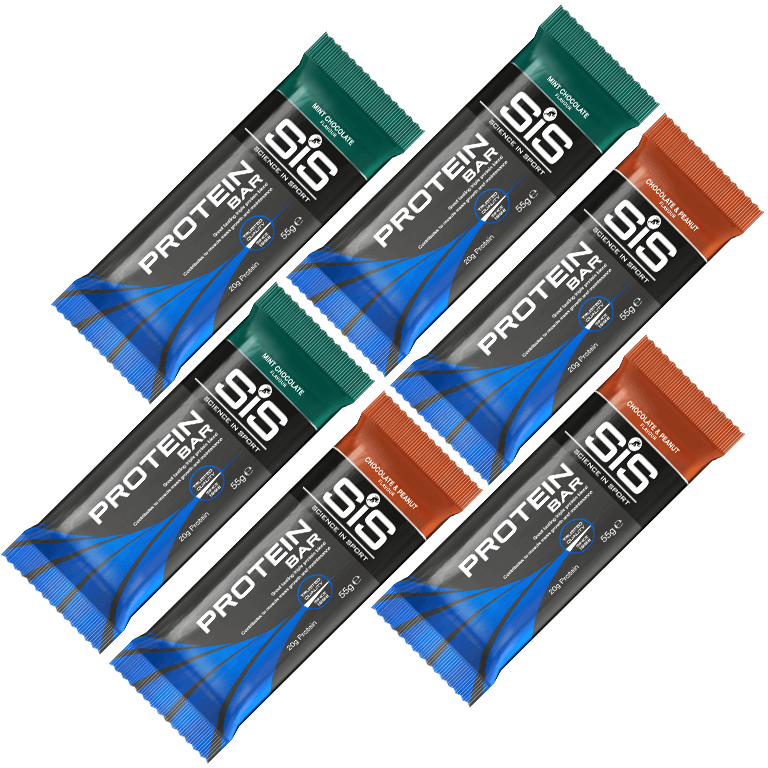 SiS Protein Bars contain a blend of easily digestible, quality proteins that act as a trigger to stimulate protein synthesis. We always recommend that food should come first in your diet. However, SiS Protein Bars are a convenient source of protein on the go to achieve the recommended 20-25g of protein every 3-4 hours. If you are training again sooner and/or hydration is a concern, we suggest having REGO Rapid Recovery post exercise. Solid foods like SiS Protein Bars take longer to digest compared to liquids like REGO Rapid Recovery. Aim for 1-2 SiS Protein Bars a day, consumed between meals, before and/or after a workout. They have the potential to melt in warm conditions. In this situation, SiS GO Energy bars may be a better choice as they are designed to be used during exercise. SiS Protein Bars contain 17-18g of sugar per bar to aid taste.